Eliminating a Deep Overbite with a non invasive treatment. No shots, no grinding down of teeth. The jaw position is restored and anti aging benefits are clearly visible. Deep adult overbites can be corrected in as little as one week by only treating the teeth. Most of the time the lower jaw looks smaller than it’s actual size because the deep bite forces the lower jaw back towards the ears. By optimizing the bite, using the VENLAY® technology, the lower jaw will naturally reposition. The entire facial proportions will improve and the the lower jaw will look larger because it is now in its optimal position. By utilizing his non-invasive dentistry VENLAY® restorations, none of the teeth have to be ground down and no jaw surgery or braces are necessary. The high tech, ultra low radiation technology utilized by this dentist can actually see the most ideal position for the lower jaw. This technique reduces the guess work which makes his care highly predictable. Many entertainers, singers, company executives, educations and political professionals do not have the time to be treated with surgery. Today, there is a high tech option to surgery that can provide overbite correction quickly and also improve the size, shape and color of the patient’s teeth. The face will be better proportioned, the facial profile will be improved, the patient will have better lip support and many of the patients TMJ symptoms can be significantly reduced or completely eliminated. 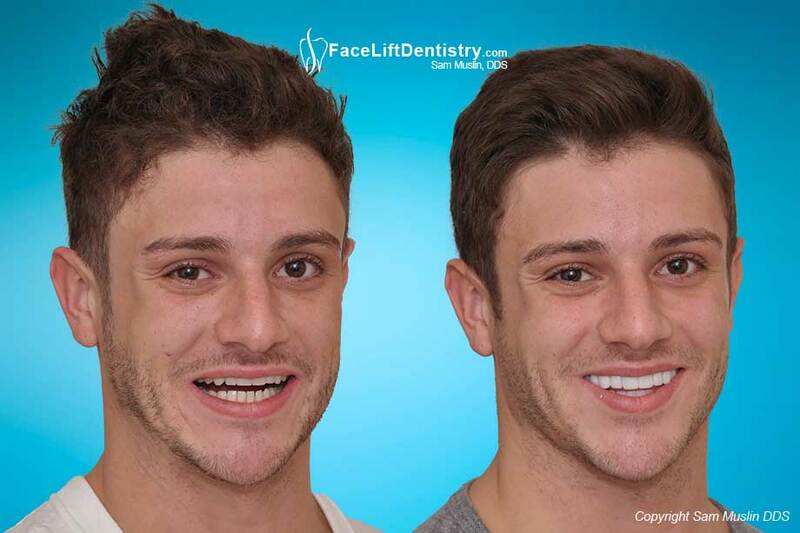 The reason that Face Lift Dentistry® is more predictable than braces and surgery is that the results can be tested before treatment is started. On the first visit, the patient will see for themselves, using their own face, the actual results that are possible with improvements in the proportions of the face, chin position, facial profile and a special removable appliance can be made to test the results. This is a new age of dental technologies that provide results that improves the lives of his patients.